The Filter tab sheet in the data frame displays a filter tree within a subframe as a standard interface for initiating queries. It is a branching diagram of the table's fields and of links to related tables. Clicking a button will display the field structure of a related table. A click on the plus sign beside any item displays fields and filter subtrees below the item. A non-functional example can be accessed in the navigation frame via the projects tab sheet. Select the "BSM Collection Bryophytes" item and open this project in the context menu (right mouse bottom). (In the current version, access to the items in the subtree is disabled.) 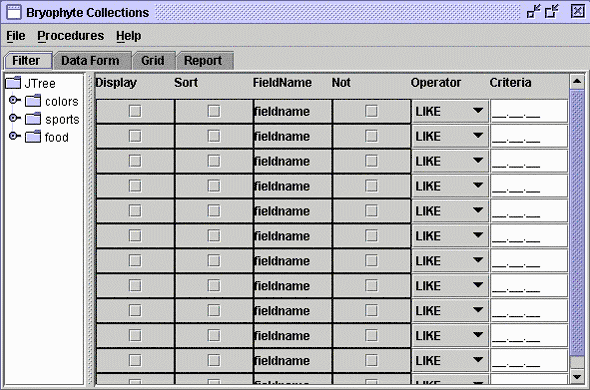 Subsequently select the Filter tab sheet in the data frame. This page (revision-1) last changed on 12:20 15-Feb-2007 by unknown.